The Board of TANATEX Chemicals, saw several changes commencing 1 January 2019. 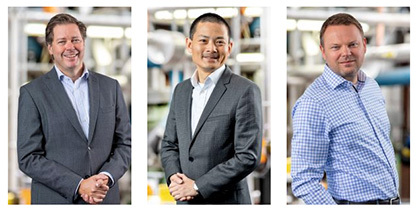 With a new CEO – Jørgen Vendel, CFO – Calvin Qiu, and CTO – Paul Oude Lenferink, a new era starts for the company. Calvin Qiu has been working during the past 18 years for multinational companies including China Eastern Airlines, Cisco Systems, Shell and, most recently, AkzoNobel in various senior global business and financial roles. Calvin brings to the company a unique combination of financial expertise and commercial acumen with a background across China and the Netherlands, both professionally and culturally “I am excited to join TANATEX and take upon this unique opportunity to grow TANATEX business together with colleagues, partners and customers from TANATEX and Transfar. I look forward to taking part in this journey and will strive to unlock the value for stakeholders including employees, customers and shareholders”. In the continued pursuit of the strategic objectives of TANATEX, the role of Chief Technology Officer has been elevated to Board level recognising the importance of technological competence, innovation focus and product stewardship. Paul Oude Lenferink has been appointed Chief Technology Officer (CTO) as of 1 January 2019. Paul has been responsible for R&D and technology developments during the last eight years within TANATEX Chemicals, and has extensive experience in the chemical industry. More News from Tanatex Chemicals B.V.